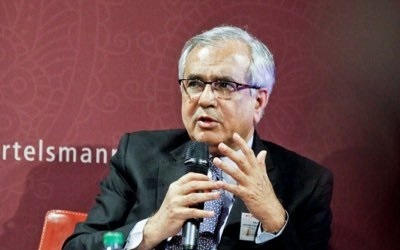 New Niti Aayog man Rajiv Kumar compared Modi with Gandhiji, called choice of Adityanath for UP "courageous"
Has the decision to appoint economist Dr Rajiv Kumar as successor of NITI Aayog vice chairman Arvind Panagariya, who announced his resignation for the powerful post less than a week ago, something to do with Dr Kumar’s more recent incessant support to Prime Minister Narendra Modi, that too mostly of political nature? Author of the book “Modi and his Challenges” (2016), where he is critical of Modi, in his tweets, Dr Kumar, who is a DPhil in economics from Oxford, and has served in FICCI, CII and Asian Development Bank, in his more recent tweets criticizes Lalu Prasad Yadav for “using secularism to promote dynasty and corruption” and “cynical use of Muslim voters”. In another tweet, he praises the Modi government for “arresting” seven Hurriyat leaders, whom he calls “mere paid pawns of the ISI”, even as asking it to begin “delivery of good governance for Kashmiris”. In one of the tweets, Dr Kumar doesn’t think UP chief minister Yogi Adityanath is “anti-development”, insisting, the “BJP has taken a big risk and laid itself to acute scrutiny and accountability on development”, adding it “takes courage” to do it. In fact, Dr Kumar compares Modi with Gandhiji: “Modi’s exhortation to both party members and common citizens for an unrelenting effort towards India’s rapid transformation is reminiscent of Mahatma Gandhi’s call for not stopping with independence and continuing the struggle until the tear was wiped from every eye”, adding, “This is also the essence of Deendayal Upadhaya’s Antyodaya -- the BJP’s guiding principle”. 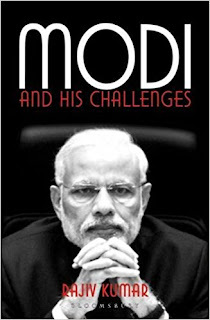 This was clearly an about turn from what was there in what could be described as his a more balanced book, Modi, which he came out last year. In this book, Dr Kumar advises Modi to make “mid-course corrections”, one of whom being that it would be “far too diverse and eccentric to be ruled unconditionally by a central authority”. Elsewhere in the book, Dr Kumar says, "Modi has, for some mysterious reasons, consciously dispensed with the prime minister's economic advisory council; abolished also the national manufacturing competitiveness council; not appointed a professional economist in the PMO..."
To me, comparing anyone in today's political spectrum with Gandhiji is sacrilegious. One cannot help but wonder if Rajiv Kumar has changed his opinion about Modi, in the short span of one year, because he has been offered this job?